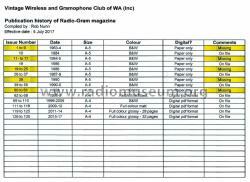 The Vintage Wireless and Gramophone Club of Western Australia Inc.
Radio-Gram is the Newsletter of The Vintage Wireless and Gramophone Club of Western Australia. It is published in pdf format, available on line from their website http://vwgc.org.au/index.html and via mail to members in hardcopy. Minutes of meeting, articles written by members are published on radio receivers and gramophones (or phonographs), amplifiers, telephones, musical boxes, tape recorders, television receivers and other associated equipment and memorabilia.